New York Cosmos B head coach Carlos Mendes has been named the 2018 NPSL Coach of the Year. The selection was made after an online vote by teams, media members, supporters, and fans. 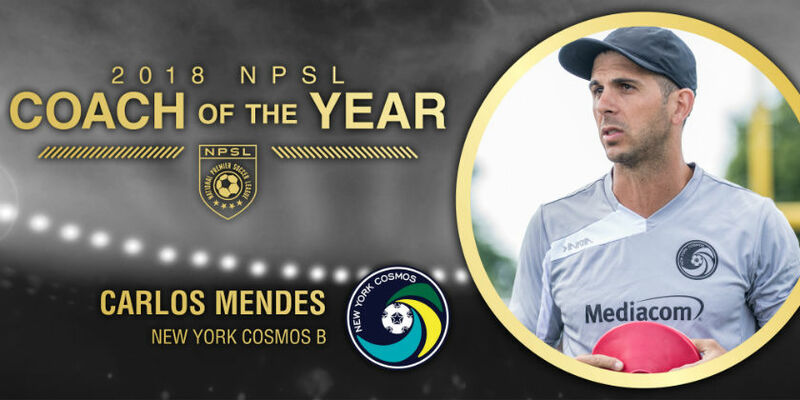 Mendes led the Cosmos to a North Atlantic Conference championship and an NPSL record of 12-1-1. Born and raised in Mineola, NY, Carlos Mendes became the head coach of New York Cosmos B on March 9, 2018 after a five-season tenure as the Cosmos first team captain. Mendes became the first player to sign with the rebooted New York Cosmos when he agreed to a multi-year deal on December 11, 2012. The club won three NASL Championships with Mendes anchoring the defense. In September 2016, Mendes became the first Cosmos player of the reboot era to reach 100 club appearances. Prior to joining the Cosmos, Mendes spent eight seasons in MLS, including his first seven in New York with the MetroStars/Red Bulls. He ranks second on the franchise's all-time games played list with 146, 128 of which he started. During his tenure in New York, Mendes helped the team reach its first and only MLS Cup Final appearance, a 3-1 loss to the Columbus Crew.